I came across this old map of Cardiff the other day and thought I’d post it to make up for the fact that I’ve not posted much about the local history of this fascinating city over the years. I can’t find a date for the map, but I guess it is from the early 20th Century. The most interesting thing about the map is the pretty extensive network of canals. The Dock Feeder Canal still runs down from the top of the map then turns East and past the North side of the Castle, and then South again towards Cardiff Bay. Some of its route is now underground, including the section that used to be Edward Terrace and Pembroke Terrace, which now form the two sides of Churchill Way under which the canal still flows. It’s worth mentioning in passing that most of the present Cardiff Castle is basically a late 19th Century folly, but it is the site of much older buildings, including a Norman Keep and a Roman fort. When the Romans occupied the location, the area from the Castle down to the sea was basically a swamp, flanked by the flood plain of the Taff to the West, with the salt marshes of Cardiff Bay to the South. Almost all of present-day Cardiff is reclaimed land. The Dock Feeder Canal was constructed around 1840 in order to supply water to the Docks in Cardiff Bay so that they could be operated even when the tide was out. This gave Cardiff one of the world’s first 24-hour docks and led to a rapid expansion of commerce and population in the city during the mid-19th Century. 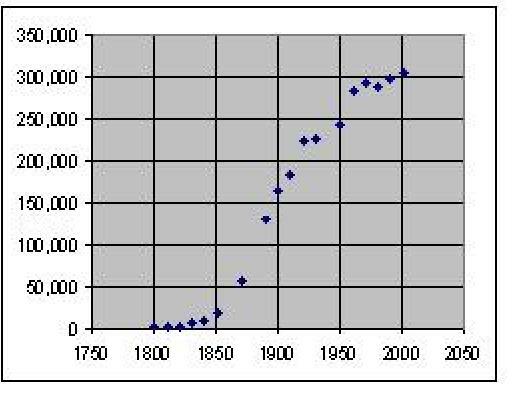 The expansion of the docks in Cardiff Bay, driven by the export of coal from the valleys, seems to have been the main factor in driving the population increase, and this accelerated markedly from the middle of the 19th century until the early 20th century. Early on in the industrial revolution the South Wales valleys were primarily concerned with the production of iron. In February 1794, the 25-mile-long Glamorganshire Canal was opened between Cardiff and Merthyr Tydfil to bring iron products down to the coast and for nearly 50 years was unchallenged as the main transport link between the two towns. It was later to become the primary route for carrying coal to the Bay. The Glamorganshire Canal can be seen on the map too, but has now virtually vanished, the route it used to follow now just being marked by new roads; for example, the route it used to take to the East of Bute Park is now covered by North Road. Here is an old photograph of Mill Lane, now the site of a number of not-very-salubrious eating and drinking establishments. 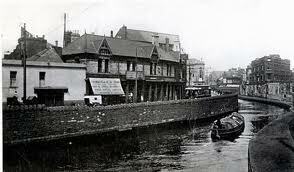 I suspect not many Cardiff residents know that less than half a century ago, these were canalside properties.. In October 1839, the Bute West Dock covering 19 acres with 9,400 feet of quays was opened, and the construction of the Dock Feeder to regulate the water supply to the dock from the River Taff was completed. Entirely paid for by the second Marquis of Bute, this new dock set in motion Cardiff’s amazing growth to become the world’s biggest coal exporting port. The Taff Vale Railway was opened in 1841 between Cardiff and Abercynon and soon overtook the Glamorganshire Canal in economic importance. Coal shipments from Cardiff exceeded one million tons for the first time in 1851. In December 1855, the first historical trainload of Rhondda steam coal arrived at Cardiff, where the Bute East Dock was opened. By 1883 the docks handled six million tons of coal and by 1913 this figure had grown to a staggering 10.7 million tons. 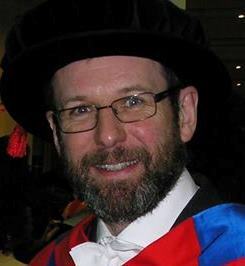 Much of the labour needed to handle this volume of coal came from immigrants, including very large numbers of Irish but also lots of other people from all around the world. By 1850 there were no less than 20 foreign consulates in Cardiff and the city quickly established the cosmopolitan reputation it has kept to this day. After the end of the First World War the coal trade suffered because the market was flooded with cheap German coal used for war reparations. That, and the subsequent depression, led to a decline in Cardiff as a port, although it was very busy during the Second World War. About 75 per cent of the supplies for the American forces in Europe were shipped out through Cardiff docks following the D-Day landings in June 1944. This was a short-lived renaissance; the last ever shipment of coal left Bute Dock in 1950. Taff Vale Railway Station is now named Queen Street Station, and Great Western Station is now Cardiff Central. 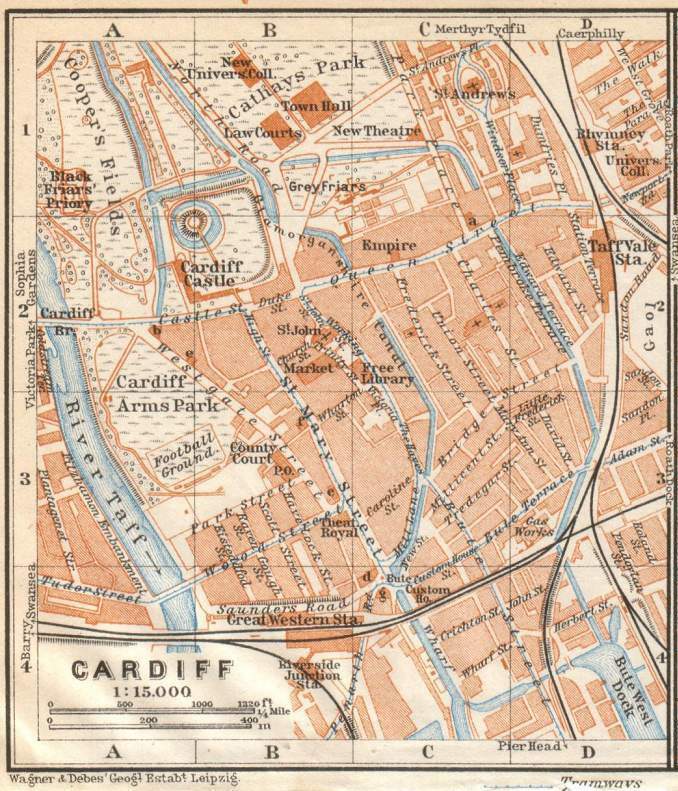 Note that Cardiff Arms Park was actually surrounded by parkland when this map was drawn, but now the area around is built up (and of course the Millennium Stadium is now there too). Much of central Cardiff has been replaced by modern malls and the like, but the Central Market is still there.